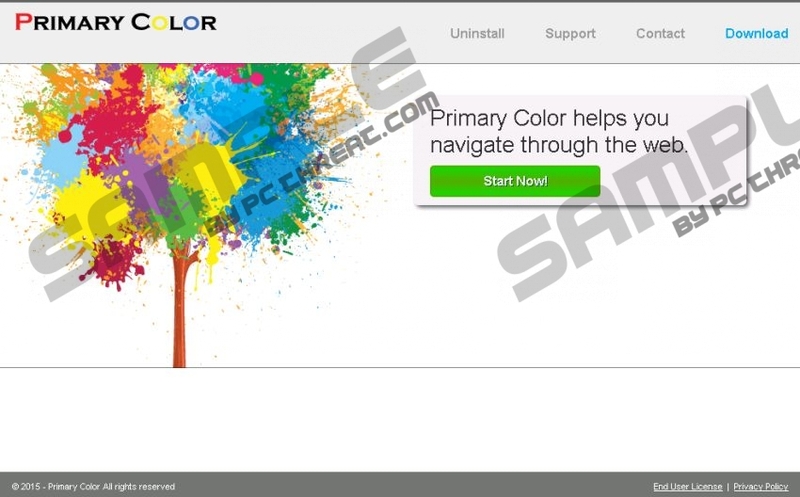 Primary Color is an advertising-supported program that you should avoid installing because it might cause security related issues. If this adware app is already on your PC, remove it immediately because its presence might be the first step in the downfall of your computer's security. Of course, if you access the official site getmyprimarycolor.com, you might get swayed by all the promises about the improved browsing experience. However, we identify this app as highly suspicious, so it is best that you delete it as soon as possible. Primary Color might not seem as innocuous as it wants you to believe. Continue reading to learn why our researchers identify this application as a security threat. Primary Color was created by SuperWeb LLC, a developer that is known to distribute its products through indirect channels rather the official sites. If you already heard such names as Magic Ball, Product Deals, Ysearchservice, know that they all come from the same family of intrusive adware apps that reach target machines via software bundles. Be cautious when you install free programs found on third-party download sites, because you might accidentally install additional unwanted applications. Primary Color might spread in a software package with additional adware programs, or even malware, so install a reliable antimalware scanner to remove the potential threats this app might have sneaked onto your PC with. The labels "Ads by Primary Color" or "Provided by Primary Color" are the first indication that this adware is already working on your system. This app connects to advertising servers to flood your browser with this commercial content wherever you go, thereby making online surfing a less entertaining activity. What’s more, the possibility of infecting your computer with Trojans, worms, ransomware, and other threats via unreliable third-party links is another reason why skilled users do not hesitate to delete Primary Color. Do not waste time and access Control Panel to remove Primary Color right now. However, even though you will accomplish the manual removal successfully, do not forget to scan your system with a reliable antimalware program. Sometimes adware programs leave active components, which might continue all the suspicious activities even after the removal of the main program. Generally these additional elements are difficult to locate manually, so this is why it is important that you rely on professional software. Type “control panel” and click OK. Choose the application you wish to remove. Select the application you wish to remove. Quick & tested solution for Primary Color removal.